Putu Anom Mahadwartha was borned in December 23, 1973. He is the fifth of five brothers and sister. His field of studies are corporate finance, investment, corporate governance, risk management, valuation modeling, and financial reenginering. He published several journals, acceredited and international reputable journals. Feel free to find out his paper on researchgate, ssrn.com, and google scholar. 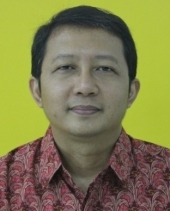 He becomes reviewer of several journals (both national and international), as well as reviewer for national grant.